For many residents, the bathroom is the most important section of the house. Paying attention to its functionality and aesthetics is of high importance. Gone are the days when toilet was just used for shower and brushing your teeth. 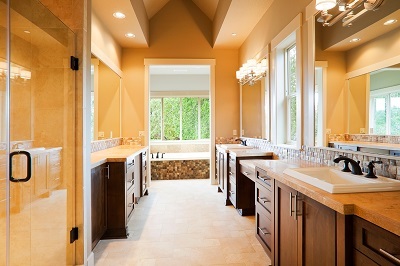 These days, scenario is quite different – bathrooms are considered to be depiction of your lifestyle and character. Whenever guests visit your place, they visit your bathroom for obvious reasons. If the bathroom appears dull, damaged and unattractive, it will not leave a good impression. It is noticed quite often that residents spend all their time, money and energy in decorating their drawing rooms, living rooms and bed rooms, unfortunately for them, they overlook the bathrooms. It’s a huge mistake, these days bathroom portrays a lot about the owner’s lifestyle and thought process. Remember the good old saying “first impression is the last impression”. No matter how well decorated your home is an unattractive bathroom will kill all the fun. If you are fed up of the dated fittings and dull walls of your bathroom, it’s high time to opt for a makeover. These days, bathrooms of standard modern properties are quite small with toilets, few cupboards, sinks and the normal plumbing setup. However, if you are planning to give a classy, high end and a luxurious feel to your bathroom then there are numerous very good options. Don’t just go for anything fancy, make sure it suits your style and still looks good. Do not just pay attention to the decoration bit; make sure plumbing is also very well taken care of. Plumbing is the more important bit, if you looking for long term solution. There are many websites loaded with information not just about good decorative tips but also plumbing tips and you can always hire a good professional plumber to get the job done efficiently. Therefore, it is highly recommended to weigh all your options online as well before you make the final call. By taking this route, you will have a clear picture of the plumbing coasts as well the cost of the products. It you think that bathroom installation might be easy then that is certainly not the case, it requires a lot of attention to detail. Therefore, hiring a professional plumber is the right way to go about things, it might be costly but it is definitely worth it. With numerous plumbers and installers around, selecting the right person for the right job is not easy. It will take time but with right kind of research, you will definitely find the right person. There are many fraudulent people out there as well in this field so taking a careful approach is very important.